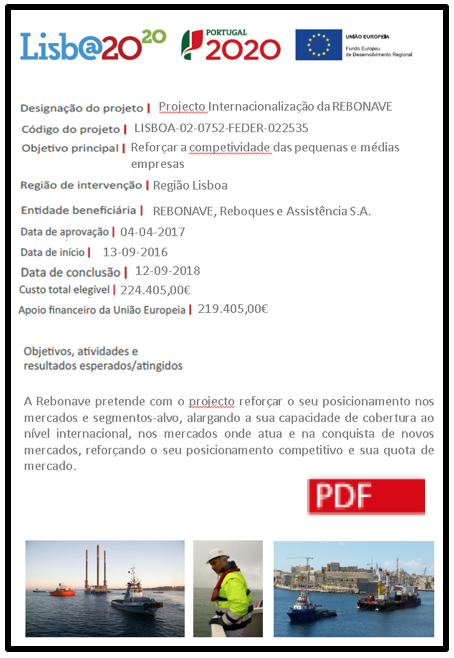 A REBONAVE tem o apoio do Portugal 2020, nos Projetos de “Qualificação e de Internacionalização”, desde 04/04/2017, com o objetivo de se posicionar no mercado internacional e reforçar no mercado nacional, com a aposta principal em ações de prospeção comercial e de marketing institucional. With the premise of improving its performance, in a logic of continuous improvement, REBONAVE advanced with the process of Certification of its Management System of Quality, Environment and Safety / Health at Work, within the scope of normative references ISO 9001: 2015, ISO 14001: 2015 and OSHAS 18001: 2007, becoming one of the first companies with triple certification, by the references of 2015 (Quality and Environment) in Portugal. SSI in Genoa is a well established company coordinating commercial transport in the international market have been for many years committed to integrating the transport activities of its clients with companies and leading groups of the specific branches, in synergy with the market. REBONAVE Reboques e Assistência Naval, S.A. was recognized with the PME Excellence Award in 2016, by IAPMEI . This award aims to recognize, the merit of small and medium enterprises with high performance profiles. This recognition is conceived to prove that REBONAVE SA has financial soundness and profitability above the national average, having successfully maintained high standards in a particularly demanding competitive environment. It also demonstrates how our company is overcoming the crisis with growth, results consolidation, adding value, wealth and employment in local region. REBONAVE Towage and Maritime Assistance, S.A. supported by IAPMEI Program FINCRESCE, developed to identify and recognize high performance companies, was considered and recognized by management skills and performance, renewing his PME Lider Award in 2016. This award is particularly relevant considering the fact that its his 8th award on consecutive years. This recognition is conceived to reinforce visibility of high performance/competitive small and medium enterprises, in the Portuguese Economy, and contribute for their sustainable, continuous growth, and well fair..
Top exporters enterprises ranking result on the application of rigorous methodology and criteria for data assessment by Informa D&B. Evaluated data is based on performance measurables and economical-financial criteria. This Portuguese Ranking is constituted by all types of export private companies (big and SME), assessed on a yearly basis. Based on this REBONAVE was recognized with the TOP EXPORTA 2015 AWARD, for the second consecutive year. REBONAVE and the Portuguese Merchant Marine Academy (Nautical School - ENIDH) have signed collaboration protocols, for on-job training, providing students opportunities to make internships in our company. With this protocols, it is intended to approach school and business parts, maximizing learning opportunities of maritime students. REBONAVE was recorded as an official supplier of NATO (North Atlantic Treaty Organization), through its Support Agency, "NATO Support Agency (NSPA)" - expanding the scope of its supplies. REBONAVE became a Maritime Industry Association (AIN) member – which promotes and encourages enterprises initiative related with maritime activity. This association aims to contribute to sustainable growth and improvement of service provision to community. In November 2013, REBONAVE became a member of AAMC - Portuguese Shipowners Association. It is our aim to promote Shipowners interests so that the industry can best serve Portuguese and European sustainable trade and commerce in a competitive free enterprise environment to the benefit of shippers and consumers. 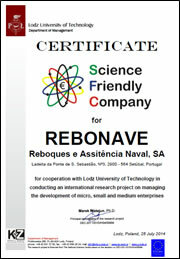 REBONAVE was considered a "Science Friendly Company“, by a Polish University, with the scope of management and development of small, medium and microenterprises and obtained a certificate "SFC - 2014". 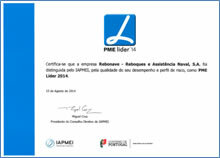 Rebonave - Reboques e Assistência Naval, S.A. was recognized with the PME Lider Award 2013 by Banco Espírito Santo (BES) for its financial soundness, quality and management leadership. This award reinforces and recognize one of Rebonave main values (Leadership) , already distinguished with the PME Lider 2013, by FINCRESCE program, from IAPMEI. REBONAVE has been registered in CCR (Central Contractor Registration), as supplier for the Federal Government of U.S.A., under the DUNS 452486616. On July 27th, 2012 “MAMMOET Salvage B.V. and REBONAVE S.A., signed a form of co-operation agreement in order to be able to offer comprehensive salvage services to the maritime industry. Salvage and wreck removal of ships and offshore installations, including wrecks removal on port entrances and navigational channels, and environmental protections activities. 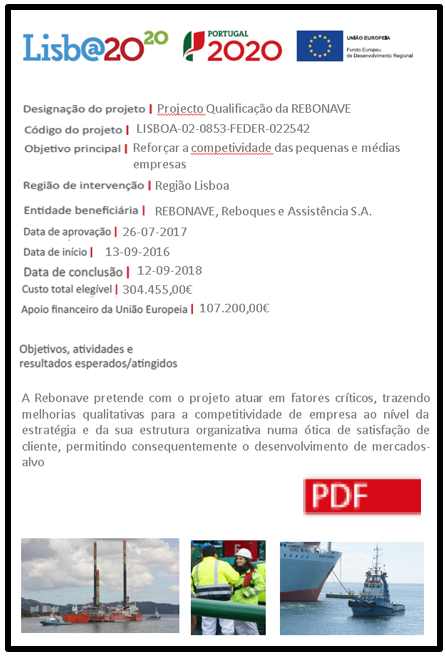 In January 2014, REBONAVE became member of the CPS – Setúbal Port Community., supporting and contributing for the sustained development of all Shipment and Port Activities of this region. 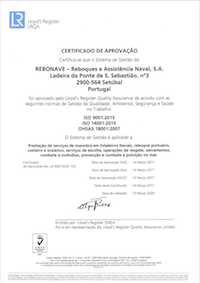 REBONAVE has been registered is SIRAPA (Integrated System for the Register of Portuguese Agency of the Environment), under the ID nr. 0006137.